But anyway here are a couple ideas with lists for what you need to make them. 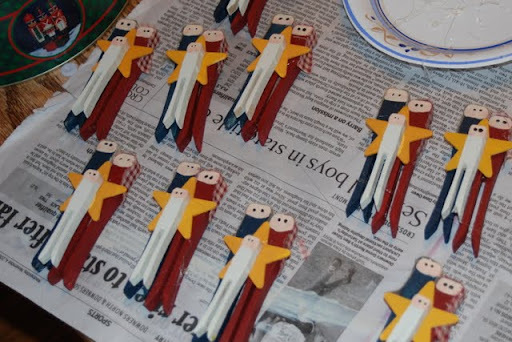 I will see if I can get that tutorial up for the Creche ornaments soon. Edited to add a link to the tag (without my name and year on it.) It is a jpg file, I guess if you have Photoshop you could add your own name or you can just print it on cardstock and write your own name. Here is the link. Enjoy!! 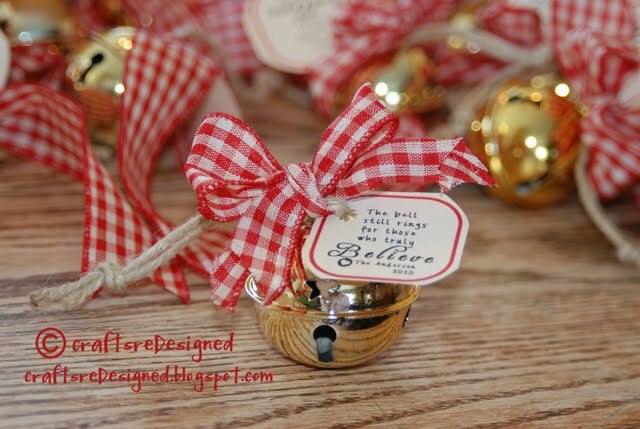 Tag that says "For Unto us a child is Born"
I saw your Polar Express bells on Pinterest! The design of your tag is gorgeous. Any chance you can make the printable available? We are starting to get into the holiday spirit already! Thanks! I've added the tag printable. I was pretty surprised to find it was pinned on pinterest. Hope your holidays are Merry! I also just found on Pinterest. Will have fun making these. Thanks! Thank you so much for the bells - this will work great from friends at work who are from India and have different beliefs. They are so wonderful to share trinkets with me. Now I have something that is seasonal and still open for interpretation! I found your Polar Express bells on Pinterest. I just made my version of these for my kids to give as gifts to their teachers this year. Thanks for the idea!